I decided yesterday morning that I wanted to ride my bike somewhere that I haven't been before. Since I've covered much of the ground that's easily reached from my house, that likely meant driving to the ride, and that opens up a bunch of roads in the Santa Cruz mountains a little north of my usual haunts. 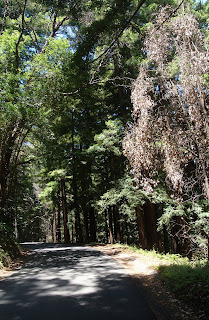 In the end I settled on Old La Honda Road, a road quite popular with bicyclists. As it turns out, it's the old road to the town of La Honda (as opposed to the current road to Old La Honda). It has since been replaced by... well, La Honda Road, aka Highway 84. Or maybe New La Honda Road. Why did they replace it? In many parts it's just one lane, often running along hillsides or between redwoods, and thus presumably difficult to widen. It's therefore a road just for the (many) houses along the road, and bikes. I parked on the Stanford campus, which I take it is much easier on the weekend than it would have been during the week. 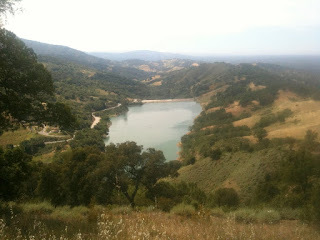 I took Sand Hill Road past 280 and into the hills. There's a small dirt parking lot at the top of the first hill after 280; that may be something to remember for the next time. From there Sand Hill Road dips down to meet Whiskey Hill Road, an intersection now notorious for being the place where local bike riding and engineering legend Jobst Brandt had a bad crash early this year. Inspirational guy; he was riding this at age 75 and would certainly have climbed much faster than I did today. This intersection is also directly in line with the end of the Stanford Linear Accelerator, but I didn't know that until after I'd got home and looked at a map. Sand Hill Road climbs up to meet Portola Road, and indeed turns into Portola Road there. Apparently, right about at that intersection is the site of an 1850s mining town called Searsville. 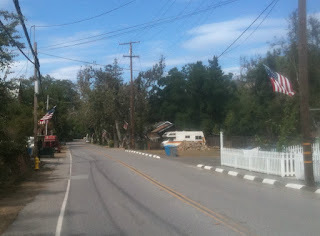 Shortly after the intersection, Old La Honda Road heads off to the right. Having ridden most of my miles further southeast, I must say that the overall impression I got of the area was: busy. There were dozens of bike riders on Sand Hill and Portola. Always at least one in sight, and often riding in groups. The one thing they all had in common was that they were passing me handily. 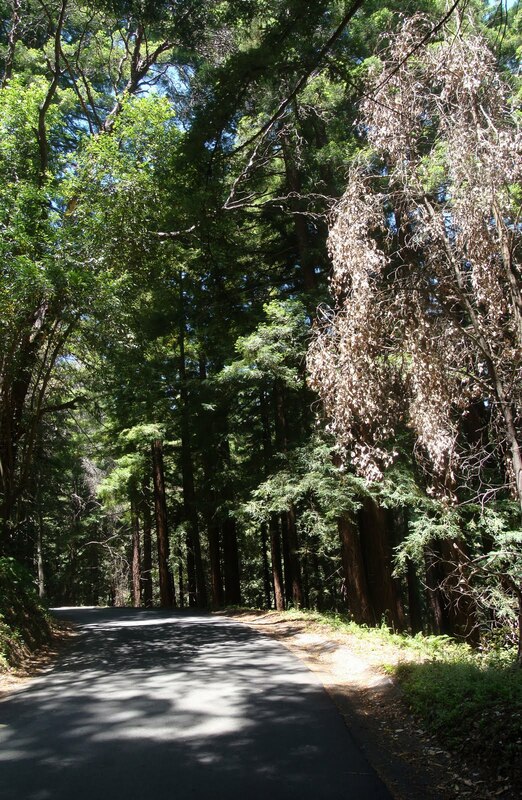 Old La Honda Road is a pretty little road, often a single lane and frequently fully covered by a tree canopy. Somehow I had expected the climb to be easy, but my lack of conditioning, the warm weather (perfect by any reasonable standard, but not cool enough to keep me from overheating) and the slightly steeper than expected road really knocked me out. I tried pacing behind a couple of other riders and found that it mostly just tired me out. One must climb at one's own pace. In my case that meant I was being passed by everyone, young and old, male and female. As I said, the road is often lined by trees, and just as often by houses, at least on the lower stretches. That's good for shade, but lousy for views; I don't think there's a view into the valley on the entire road. A little further up the road you start to see redwoods. The road up here appears to be recently repaved, and even seems a little less steep. I noticed that there's yet another road called Summit up here, in this case nowhere near any summits. For some reason the bike traffic on the lower slopes largely disappeared as I got toward the top. Maybe everyone just gets an earlier start than I did, but on the entire remainder of the ride, the traffic was what I'd consider normal, not busy. Eventually Old La Honda Road meets up with Skyline, aka Highway 35, at about 1700 feet elevation. Old La Honda continues down the other side of the ridge, eventually meeting up with New La Honda Road and eventually La Honda itself. The portion I rode up is sometimes referred to as the East section, and other side is, naturally, the West. I take it that a lot of the folks who passed me probably headed north on Skyline to descend on Highway 84. My plan was to go south on Skyline to Page Mill Road, and take that back to Stanford. So I headed south, inevitably upward (Skyline always climbs, in all directions). 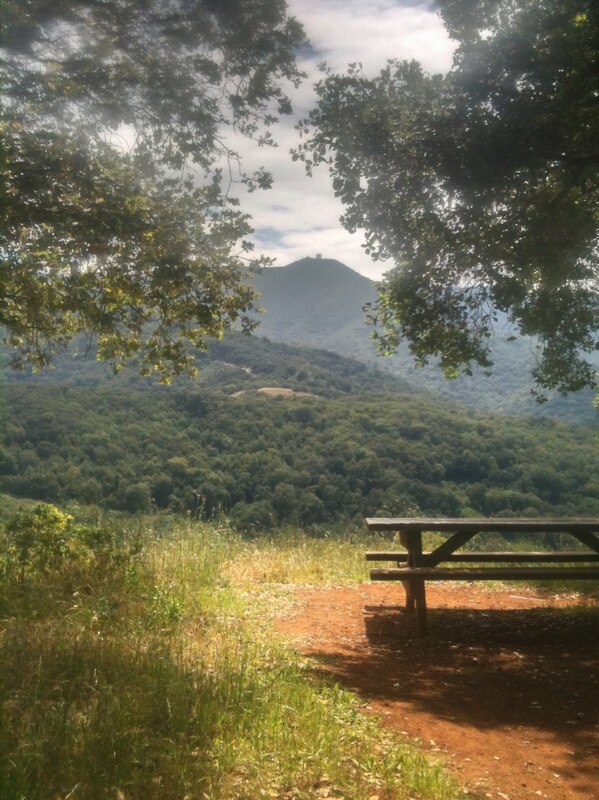 The first thing you reach on this path is the Windy Hill Open Space Preserve, near which are glorious views both east and west. There's something special about having those long views on both sides of a ridge -- it makes you feel like you're on top of the world. Near Windy Hill, looking west. Skyline climbs to nearly 2400 feet by the time it links up to Page Mill Road. I was expecting, at this point, to coast all the way back into the valley, but Page Mill Road actually rolls a bit near the top. After that section, though, it's a relatively fast descent, across 280 and then one last small hill, and finally back to the campus. I love seeing new places, and in that regard this was a fun ride.On the other hand, the fact that there are so many people out there interferes with the illusion that you're exploring some exotic landscape. It's all new to me, though, and given the sheer number of roads accessible from this area, I don't suppose this is the last time I'll drive to a ride up here. In the end, the GPS tells me it was about 26 miles (is that all?) and 2900 feet of climbing. That seems a little high, but close. Riding through Almaden Quicksilver Park is my normal "go out and get exercise" ride, so I wouldn't normally bother to write about it except that a) it's been a while since I've written about any rides, and b) it's been many months since I've ridden Quicksilver, so I could perhaps see it with fresh eyes. Unfortunately I would also see it through the awful lens of my iPhone, since my normal camera had no charge. I figured I might try some of the photography-related applications I have, since I obviously wouldn't be getting any decent pictures. For me, riding through Quicksilver means first riding to Quicksilver -- specifically the Hacienda entrance in New Almaden. For reasons I don't quite understand, this ride always drains me. Maybe it's just the fact that it's several miles on a mountain bike, or that it rises a little. In any case, I always start the Quicksilver ride with legs completely drained of life. 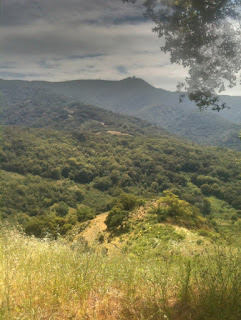 This ride yesterday was my first ride through Quicksilver since last fall. The trail is closed to bicycles after rain, and a particularly shaded part of the trail is closed entirely for pretty much the entire rainy season. This was, therefore, the first time I've seen the newly-renovated Casa Grande (the old mining office and residence) open. It seems like it's been in rehab since I moved here. New Almaden was decked out in American flags. I'm not sure why, exactly -- maybe leftovers from Memorial Day? In any case it's a festive look. On the theme of seeing things with new eyes, for the first time I noticed a memorial very near the Hacienda entrance, and went over to take a look. It turns out to be for Patrick Tillman, who grew up in New Almaden. Who knew? There were lots of flowers, at least some of which were probably from Memorial Day, but the wildflowers surrounding the memorial give it a permanently fresh look. Enough tourism: it was time to get riding. If you start at the Hacienda entrance, Quicksilver is a sort of lollipop: you ride up the Mine Hill trail to a junction at 1000 feet elevation, and then take one of a couple of loops. No options on the first section, but then lots of options. At the junction you can take something called the Capehorn Pass trail, which apparently heads down toward the Mockingbird entrance. I guess that's not really a lollipop. I've been here dozens of times, but I know nothing of that route. You can also take the Randol trail, which heads down toward the reservoir and forms one leg of a roughly 10 mile loop with the Mine Hill trail. Lastly, you can continue climbing Mine Hill to the high point of the park. My first photographic experiment was to take a 360-degree panorama of the junction area using Microsoft's Photosynth application. These panorama apps amaze me, the way they detect motion and stitch images on the fly. Unfortunately they are more effective in the act than in the result, which doesn't really bear much scrutiny. In this case, the Capehorn Pass trail (which is probably where I started) is quite muddled, as is a small area near the downhill section of Mine Hill trail. I tried several of these on the ride, and this was the best result. Still, it's a free app, it's nearly perfect, and it's composed mostly of magic, so to complain would be ungrateful. If you have Silverlight installed (like, say, if you use Netflix with this browser), click through to the viewer to get a much better experience. Taking pictures is a good excuse to catch one's breath, but then it's time to ride again. My preferred route is up Mine Hill and then around to the Randol trail, because I like to get the big climbs out of the way. This section of the Mine Hill trail is slightly less steep in aggregate, with several short flat sections. Partway up you get another choice: you can head up the Castillero trail through English Town and around the peak of Mine Hill, or just continue up the Mine Hill trail to the junction where the Castillero meets up again. 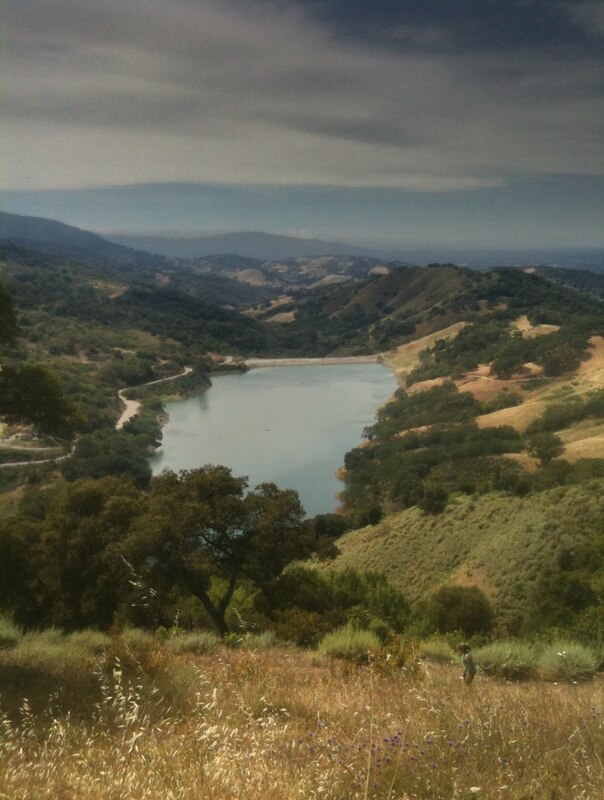 The Castillero trail adds about a half mile and reaches a slightly higher elevation. I took the Mine Hill trail this time. Another experiment I tried in this section was the Smithsonian's Leafsnap application. In theory, you take a picture of a leaf and it tells you what kind of tree it is. A miracle. The main problem with it, from my point view, is that it only really works on the East Coast -- they don't have California trees in the database yet. If they've got the pattern matching logic in place, it seems the data could be crowdsourced. The other problem with it is that it requires network access -- the analysis takes place on the servers, not the phone. That's reasonable, but in my experience the most interesting trees have poor cell phone coverage. If the upload fails the app doesn't save the image, and you can't later upload photos you've taken while out of range. So we either need to move all the trees closer to cell phone towers, or possibly change that behavior. Whichever is easier. Eventually the Mine Hill tail meets up with Castillero again at about 1550 feet, which is the high point for this ride. At this junction is a couple of picnic tables with an absolutely beautiful view, a great reward for the effort of climbing. 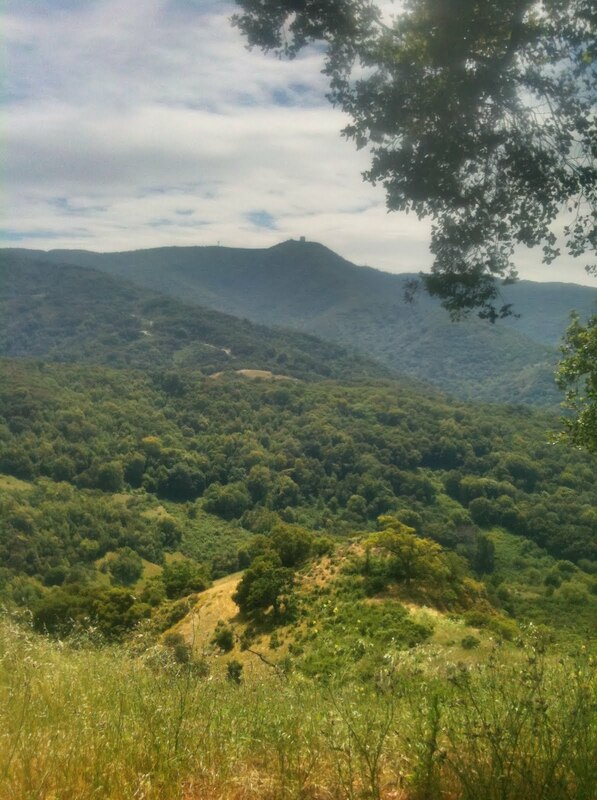 The ground immediately before you drops away into a valley, across which you see Loma Prieta, Mount Umunhum and the ridge between them. You can see Hicks Road snaking up toward its high point, and then Mount Umunhum Road heading up from there. If only I had a decent camera on me. Still, I needed to kill some time to keep my heart from exploding, so some experimentation was in order. By this time it was about 3 PM, and Mount Umunhum off to the southwest was partly in silhouette and thus an indistinct grayish-green (in the morning it's breathtaking). The foreground was clearer and more colorful. HDR to the rescue! I have two HDR apps on my iPhone: TrueHDR and Pro HDR. One of them works reasonably (given the iPhone's limitations) and the other poorly, but I don't know which is which. So it's time for an inconclusive bake-off, using the view from the picnic tables toward Umunhum. In each of these cases I used the app's automatic mode. I think the Pro HDR image looks about right, close to what my eyes were seeing. The sky in the TrueHDR looks quite stormy, whereas in reality the clouds were white. I don't like what TrueHDR did with the tree, but the wind kicked up just as I started, so I suppose I need to discount the tree since moving things are probably difficult for multiple-photo HDR apps. Based on that single sample it looks like Pro HDR is much better, but I need more examples. I took a few more HDR pictures, but for reasons that escape me now I only used TrueHDR, and the results were roughly OK. This shot of Umunhum, for example, is not too bad, although the color of the dirt is unrealistic and Umunhum has an odd quality to it. From this junction, Mine Hill heads generally downward toward the reservoir. Near the start of this section is one of my favorite views. 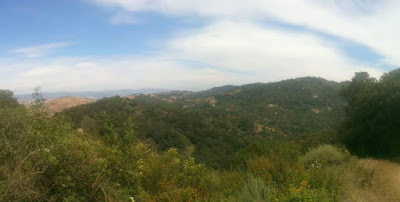 The trail at one point follows the ridge of Mine Hill, and you can stand at one point and see Umunhum off to the left, and the Almaden Valley and the Santa Teresa hills (not to mention the Diablo Range) off to the right. It's glorious. Perfect for a 360-degree panorama. Which didn't turn out. Harrumph. Since this section is downhill, I'm normally blowing through it pretty quickly. On the map there are a couple of intersecting trails, but I'd never even noticed the junctions before. So this time I stopped to take notice of where they were, but didn't explore much because bikes are generally forbidden. One of these days I need to explore some of these trails that are forbidden to bikes, but a very long hike from any of the entrances. Eventually the trail rounds a corner and you get a view of the reservoir. This would have been another good scene for a bake-off, but for some reason I forgot to do it. Instead, let's look at True HDR versus a normal shot, 'cause that's all I've got. In this case you can see how True HDR made the scene very atmospheric. Very Wuthering Heights. But not realistic. From this point the trail winds down the hill and meets up with the Randol Trail at about 820 feet of elevation. The Randol trail climbs from here to about 1000 feet to back at the junction four miles away, and rolls a bit. It's largely shaded, which is why it's closed all winter. By the time I reach this point I'm always exhausted, but I just love this trail, leg-sapping pitches and all. Both the shade and the sense of isolation are welcome on hot summer days. Returning to the junction, I've completed the candy part of the lollipop, and now retrace the stick, back toward New Almaden. 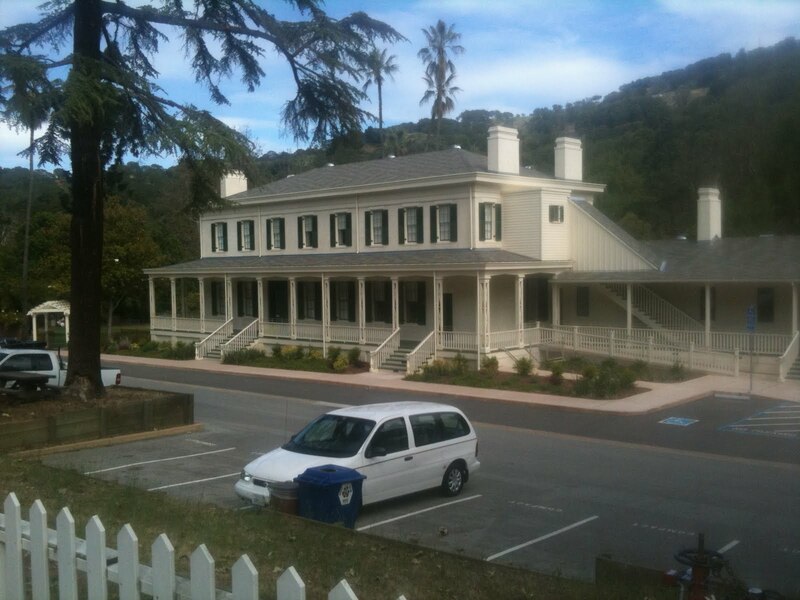 Almaden Quicksilver Park's Hacienda entrance. 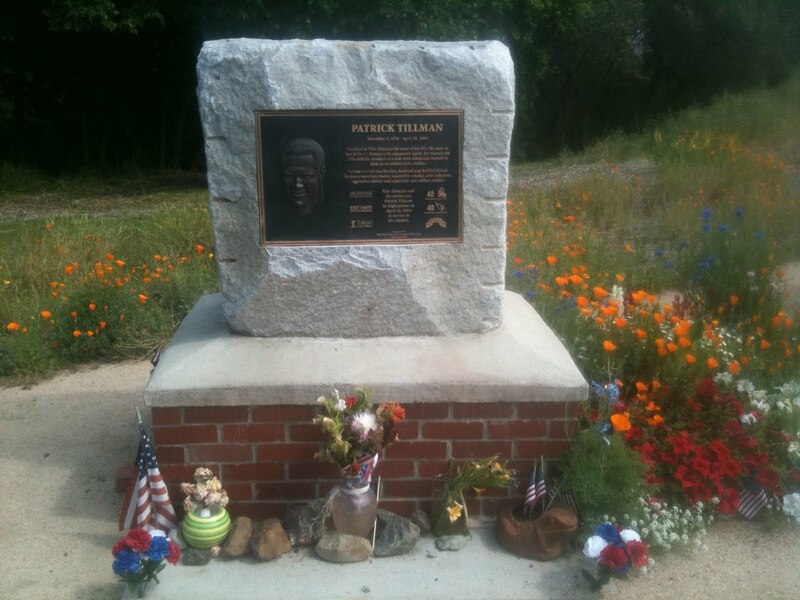 If you zoom into this shot you can see the memorial to Patrick Tillman next to the road. Roughly behind it is La Foret restaurant, which I haven't been to but is very well regarded. I was hungry when I passed by, but I suppose I wasn't dressed for it. It's easy to get complacent about Quicksilver because its close and I ride it a lot. But it's really a treasure, and despite my "stop and smell the roses" approach to this ride, there's a lot there that I've never seen and is probably worth exploring. The Garmin tells me that I rode just over 26 miles with 1800 feet of climbing, same as always.